Laura Mardis, a manager in LaPorte’s Houston office, has been named this year’s Outstanding Young CPA by the Houston CPA Society, a chapter of the Texas Society of CPAs. Laura is very involved with the Houston CPA Society, serving on the CPAs Helping Schools committee. This committee has dual functions. It gives grants to teachers of K-12 graders based on several factors. They also serve to raise the funds used to award the grants, through biannual events and by completing grant request applications. In addition to the grant portion of the committee’s duties, they also work to educate students in the Houston area about what a career in Accounting entails. Laura presented on this topic to several different audiences including Junior Achievement Inspire and Expanding Your Horizons in Mathematics. 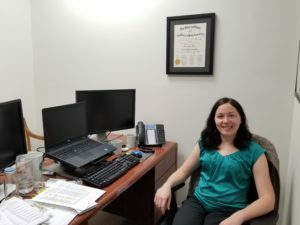 Laura has been with LaPorte since 2012 and serves in the tax services department. Established in 1946, LaPorte is one of the largest independent accounting and business consulting firms in the region, with approximately 180 personnel in Houston, TX, and New Orleans, Baton Rouge, Covington, and Houma, LA. For more information, visit the LaPorte website at www.LaPorte.com.